We sometimes get requests for recommendations about playing cards that appear to be authentic from the American Civil War or Old West period. The Civil War Illuminated Poker Deck is such a deck. Based on a Civil War era deck by A. Dougherty of New York City, these playing cards feature full-length single-ended court figures, and have no indices - as you can see from the illustration, there is no "3" in the corner of the 3 of spades. As you can also see, the corners are square, not rounded. The deck is illuminated with gold ink to recreate the look of the original cards. 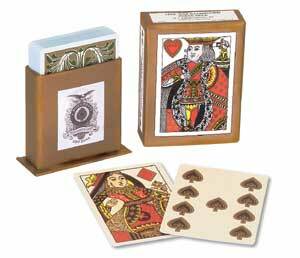 The Civil War Poker Deck is manufactured by US Games of Stamford, Connecticut.